4. 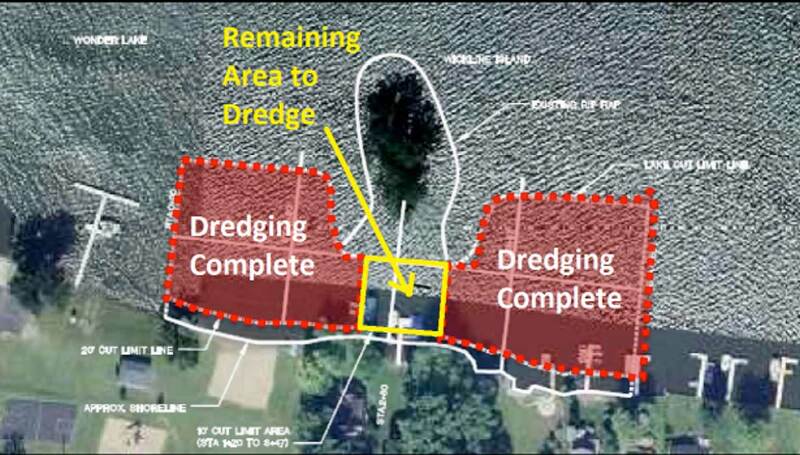 Lakefront landowners in proximity to the Wickline Islands and O’Brien Shoals dredging areas are asked to not install their piers until the dredging is complete in these areas, or the extent of dredging conducted in that area will have to be reduced. 5. Lake user’s need to be aware of rapidly changing lake conditions as the dredging contractor begins to re-deploy the sediment pipeline, booster pumps, and other dredging-related equipment. Avoiding those areas of the lake is the best bet, when possible. 6. The 32nd Annual Illinois Lakes Management Association Conference was held at the Crystal Lake Holiday Inn in Crystal Lake on March 30 to April 1, 2017. A large number of Wonder Lake residents took advantage of this opportunity to learn more about a wide variety of lake topics, and meet other lake user’s from across Illinois. 7. I am participating in a five week water quality monitoring project, with sampling supplies provided free of cost by, of all places, the Nebraska Watershed Network. Their intent was originally to do this sampling throughout the entire Mississippi River watershed, but the interest from Illinois was so high, they refocused their scope to only include. Testing will include sampling for atrazine, nitrate/nitrites and phosphate. 8. I am attaching a copy of an article from today’s Chicago Tribune, discussing water quality issues resulting from the wide-spread use of salt as a de-icing agent.